By Robert Cichielo, CTO and founder, etherFAX. Government regulations require that specific industries, such as healthcare and financial services, comply with data privacy regulations. These compliance requirements serve to protect private, confidential, and sensitive information from unwanted intruders that could attempt to intercept files in transit. Though organizations can take measures to ensure that their email solutions are agreeable to these demands, an email message will typically pass through multiple servers before it reaches the final point of delivery. This indirect transmission method leaves mission-critical documents and other unstructured data potentially vulnerable. Last year, the Federal Bureau of Investigation implemented a new policy prohibiting Freedom of Information Act (FOIA) requests via email. Now, people requesting public records must use fax machines, standard mail, or the FBI’s online portal to communicate with the agency’s records management division. While many thought it was a step backward for the FBI to use “archaic technologies” such as fax, industry veterans applauded the FBI’s decision to use one of the most trusted document delivery methods available today. To guarantee the secure transfer of information between two endpoints, the ideal fax solution must utilize well-defined end-to-end encryption methods such as those defined in the Elliptic Curve Integrated Encryption Scheme (ECIES). This hybrid encryption scheme uses Elliptic Curve Cryptography to generate a shared secret between peers to seed the encryption process with unique keying material, while signing and authentication mechanisms assure the validity of the data in transit. End-to-end encryption not only protects data at each endpoint, it also protects data at rest. Since information is never de-encrypted and re-encrypted, even if a third-party were to snoop on the information in transit, it would be indecipherable. Most importantly, end-to-end encryption schemes allow secure transmissions even over unsecured channels. While traditional fax transmissions are hampered by limitations associated with PSTN and telephony infrastructure at “analog modem speeds”, the cloud (a digital network) can offer a different and more effective approach. By leveraging the cloud and delivering all faxes via HTTPS, outdated fax boards, media gateways, and the complex telephony stack are completely eliminated. 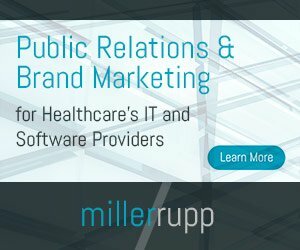 Even as HIMSS Media has said that its employees will be making more of an effort this year to cover the trade show floor and its vendors and events, hopefully this series will give you a bit more useful information about the companies that help make this event, and the industry as a whole, so exciting. Founded in 2009, etherFAX offers a solution that extends existing fax server solutions to the cloud. By eliminating the need for costly network fax systems, such as fax boards and recurring telephony fees, etherFAX leverages the Internet to manage all business-critical fax communications for healthcare organizations. etherFAX was established in 2009 and leverages talent with 30-plus years of experience designing and developing fax technology solutions. By eliminating the need for costly components such as fax boards, media gateways, and telephony infrastructure, etherFAX’s namesake technology, network and datacenter solutions leverage the Internet to manage business-critical fax communications. As a hybrid fax solution, etherFAX eliminates the complexities and costs of provisioning SIP, T.38, PRI, T1, and other analog connections. By simply connecting on-premise fax server resources to etherFAX, all fax communications are securely delivered via the cloud. Say goodbye to expensive fax hardware, complex fault-tolerant designs, and costly disaster recovery solutions. etherFAX is the fax board in the cloud, capable of processing billions of faxes. etherFAX serves the healthcare market by securely transmit electronic health records (EHRs), electronic medical records (EMRs), health information exchange data (HIEs) and unstructured patient data. etherFAX enables healthcare organizations and medical groups, insurance companies and billing operators to securely transport data and ensure compliance with government mandated regulations such as the Health Insurance Portability and Accountability Act (HIPAA). Fully integrating with existing fax servers and applications such as EMR solutions and healthcare management systems, etherFAX leverages the Internet to manage all healthcare-critical fax communications without capacity constraints. o etherFAX – Extending existing fax server solutions to the cloud, etherFAX eliminates the need for costly network fax systems, such as fax boards and recurring telephony fees. etherFAX leverages the Internet to manage all your business-critical fax communications. o etherFAX SEN – Gives healthcare and enterprise organizations the capability to create their own private fax network to ensure secure data and document transmissions. Offering a simple and unique approach to document delivery, etherFAX SEN offers speed, performance and reliability without compromising security. o etherFAX A2E – The etherFAX A2E device, manufactured by MultiTech, provides a plug-and-play device that enables organizations to extend their existing fax machines to the cloud. etherFAX DR – Provides immediate failover for all business-critical fax communications, ensuring uptime when existing telephony equipment fails, such as fax boards, PRI lines, servers and applications. etherFAX Toolkit – Integrating fax capabilities within applications has never been easier with the etherFAX API. The solution provides the capability to fax-enable custom developed applications in addition to enterprise resource planning (ERP), document management systems, etc. etherFAX Colocation Services – etherFAX provides highly-secure, protected, and climate-controlled colocation services that are capable of supporting the most complex business-critical IT environments.